Tonight we went to a friend’s birthday party. A keg of good beer, a smoky grill, a swing in the pear tree, little girls running everywhere. After dark, there were birthday candles and fireworks. This is the salad to bring to a party like that. It’s lively, spicy, crunchy, herbal, and a little sweet from all those carrots. It nestles attractively into a grillside table laden with mac and cheese, corn, and roasted vegetables. And it sandwiches nicely into a roll alongside all those other leftovers the next day. It’s from The Herbal Kitchen cookbook, written by Jerry Traunfeld, whose restaurant Poppy is one of my Seattle favorites. I advise you to try it when you visit. You can make this salad anywhere, though–and you should. 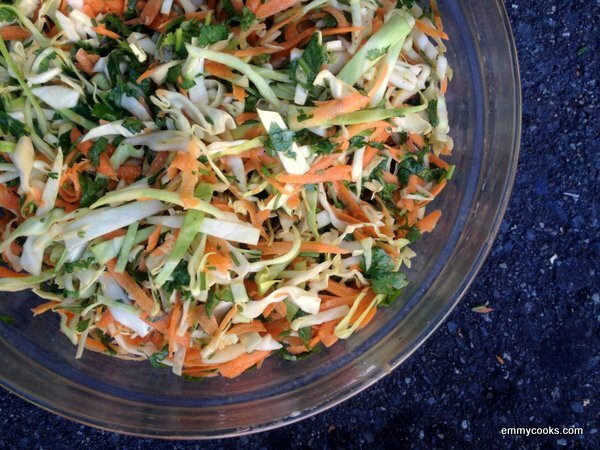 Spicy Cilantro Slaw with Cabbage and Carrots: In a good-sized salad bowl, whisk the following well to combine: 1/4 c. each apple cider vinegar, soy sauce, and mayonnaise, 2 Tbs. lime juice, 1 Tbsp. sugar, and 2-3 tsp. Sriracha hot sauce. Finely shred a pound of green cabbage and grate 4-5 carrots. Coarsely chop a medium-sized bunch of cilantro. Toss vegetables and cilantro with dressing and refrigerate for an hour before serving to allow the cabbage to soften and the flavors to blend. That sounds so good. Mayonnaise + soy sauce. Very interesting. And pretty, too! Yum! Sweet, spicy and crunchy. Sounds likes winner. Oops… Clumsy fingers on my phone. Ahem…. “Sounds like a winner”. Great to find another way to make cole slaw and it includes one of my favorite herbs cilantro. Thanks! Looks great! I’m a sucker for anything with Sriracha! Slowly catching up on blog posts now. It looks like you have had a delicious summer! Love the thought of pairing this with Mac & Cheese or adding to a burger or something. YUM! Wow. That looks amazing. I just happened to buy a cabbage, which to be honest is very unusual for me. We are, once again, vibrating on the same wavelength. Thanks! I love multi-vegetable slaws, and this one looks particularly lovely. The kick of sriracha sounds wonderful! 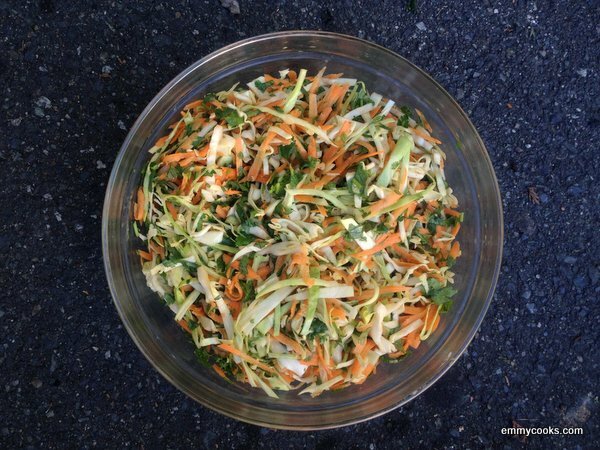 Coleslaw is one of my favorite things ever, I look forward to adding this recipe to my repertoire! I’m intrigued by the combination of mayo and soy sauce especially.